@TheTrackR - The Perfect Personalized Stocking Stuffer! Thankfully, I get to give my husband's brain a break as well as mine because I have the TrackR bravo now! TrackR bravo is a coin-sized Bluetooth device that people can attach to all their important belongings — from purses to kid’s backpacks to even pets — to make sure they never get lost. No longer do I go hours without knowing where my phone is or searching frantically for my keys when I am already late to pick up my son from school! I am loving from TrackR!! Once you pair your TrackR bravo with the free iPhone/Android app, you can use your phone to locate any misplaced item in seconds. For families in particular, using the Family Sharing option, TrackR users can share items in the context of groups that they interact with most in their daily lives – families, roommates, neighbors, etc. – enabling a “group effort” approach for quickly locating misplaced items. Plus, with the world’s largest Crowd GPS network, when an item is truly lost, the entire TrackR community is activated and will anonymously update the customer with the exact GPS location of their lost item. Lost your phone? Press the button on your TrackR device to ring your missing phone, Even on Silent Mode! TrackR's Crowd GPS Network even updates you of your item’s latest location on a map! Watch the video below to learn more! TrackR is the simplest way to find lost and misplaced belongings. Join thousands who are now connected to the things they value most. 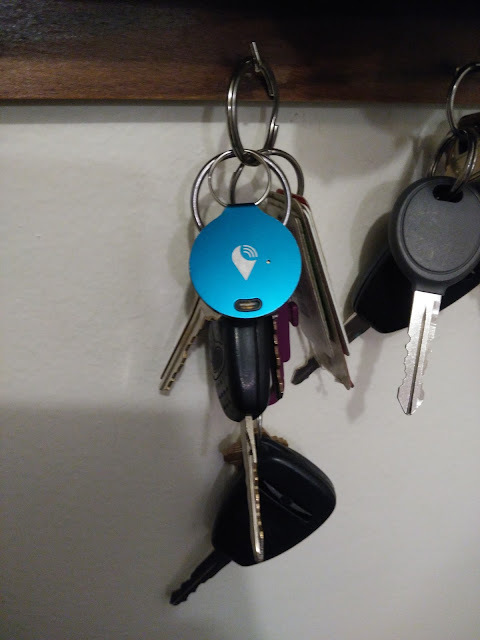 Order a TrackR today and never lose anything again! And to top it all off, they also offer custom printing options so you can choose any photo to print directly onto a TrackR, making it the perfect personalized, low-cost gift this holiday season! You can purchase TrackR bravo for $29.99 from the TrackR website.